Well, I wasn't sure I was going to get to any sort of St. Patrick's Day cookies done this year, but I knew I wanted to do this St. Paddy's version of cookies and milk, akin to my Valentine's Day set. I actually did make a double-decker cookie for St. Patrick's Day, inspired by Bridget's (Bake at 350) from two years ago (so beautiful! ), but something went wrong. The plan was to use a plaque cutter, make a rainbow from royal icing, and place an orange iced mustache (see above) on top. The only problem was, I decided to deviate from the usual rainbow colors (which I have done before, successfully) and the colors did not look good after all:( Sigh. Well, I'm grateful for easy, and quick, and cute, especially when time is short. 1. Make some mustache sugar cookies (not too thick. They need to balance nicely on the straws). 2. Frost the cookies using orange tinted royal icing. Let dry. 3. Add some detail lines to the mustache when the base color dries. (An alternative is to add orange sanding sugar after you apply the base color.) 4. 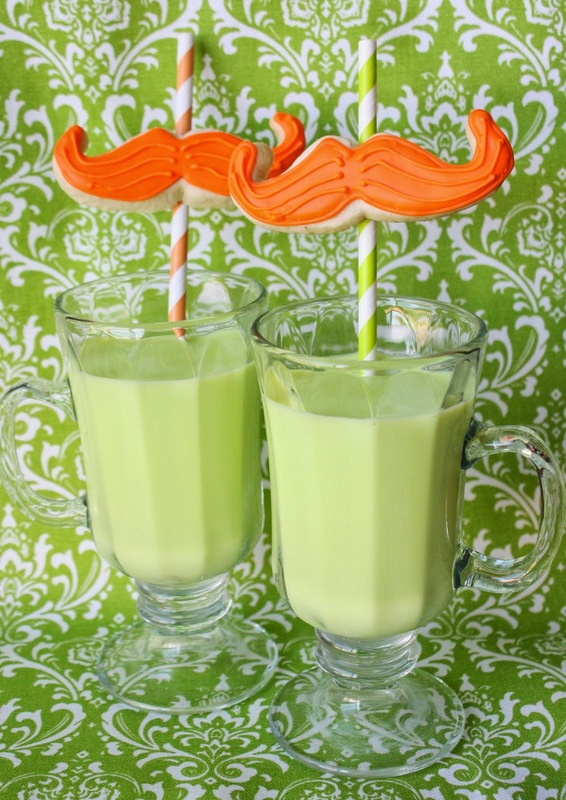 Add a drop of royal icing to the (middle) back of the mustache cookie and press gently onto a drinking straw. Let dry. 5. Add a few drops of green food coloring to a clear glass of cold milk, insert straw, and enjoy! cute! i hope you do milk and cookies for every holiday! Simple but equally as cute as the rainbow cookie. In fact, I think kids would love the green milk. They get a two-for-one treat. If you mustache...I love these! So cute, Sue. I did end up make mustache cookies for my daughter's party (haven't posted them yet) but they don't look nearly as cute as yours. Love them!!!! Especially on the straws! These mustache cookies are too cute! Love them! Oh my goodness SUE!! I love the green and orange! Pinning now! !